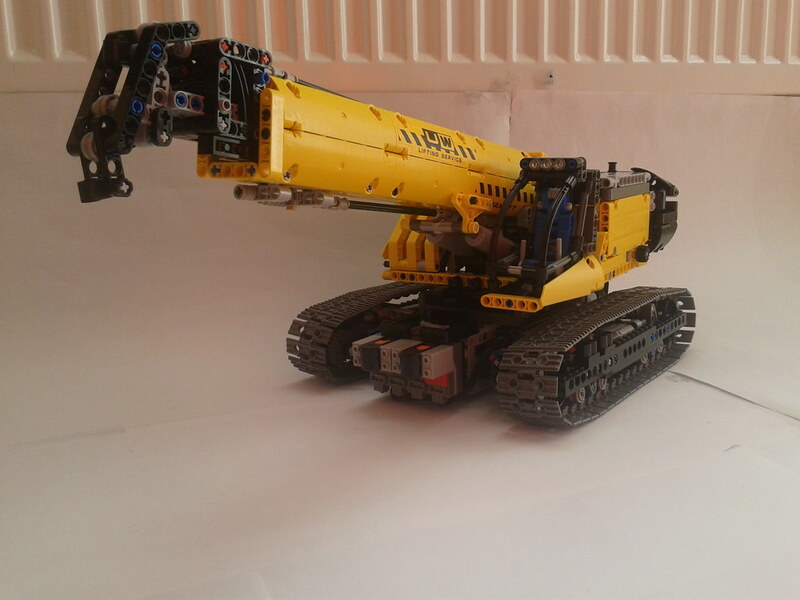 Earlier this year, dfs473 has posted a video and some photos from his Sennebogen 683R Telescopic Crane. Since then I got in love with that telescopic boom... He managed to build it in a very pleasant way - always a difficult task to make a 3 section telescopic boom like this, in a compact size, nice looking and fully functional. The model also features manual tilt of the cabin, but probably the most surprising and unseen function into a LEGO Technic model, as far as I remember to have seen, is the horizontal tracks extension, to increase footprint and stability while lifting huge payloads (see it in action at 0:29'). You may find additional photos from this model, at dfs473's flickr and Brickshelf accounts. Well done. Nice telescopic boom and expanding tracks.